The term “mobile commerce” was introduced 20 years ago by Kevin Duffey when he suggested that a mobile device could function as a retail outlet in a customer’s pocket. Considering the technological limitations of the time, who would have thought that we would one day be able to easily explore, review, and purchase goods on a small pocket-sized device? The astounding growth of eCommerce has also fueled the growth of mobile eCommerce, now worth nearly $700 billion. Mobile eCommerce is currently the biggest slice of the giant online market. Over 80% of Americans have made a purchase in the last month online—three years ago, the number was only 11.6%. A report from Business Insider Intelligence suggested that mobile commerce will increase up to 45% by 2020. ComScore research agreed and, in 2016, reported a 44% increase in spending via mobile devices compared to 2015. Despite the high sales numbers, over 60% of users still feel concerned about having their financial information hacked when using a mobile phone. Nevertheless, customer satisfaction is still fairly high with mobile retail giants like Amazon and Apple both receiving a satisfaction rating of over 80%. People are familiar with gestures like double tapping and pinching in order to zoom in to images on mobile. During a mobile eCommerce usability study, the Baymard Institute found that, quite naturally, shoppers want to be able to inspect the product thoroughly and are concerned about the small details. Users who were interested in purchasing a product but couldn’t explore it by zooming in didn’t feel comfortable buying it and often didn’t commit to the sale. 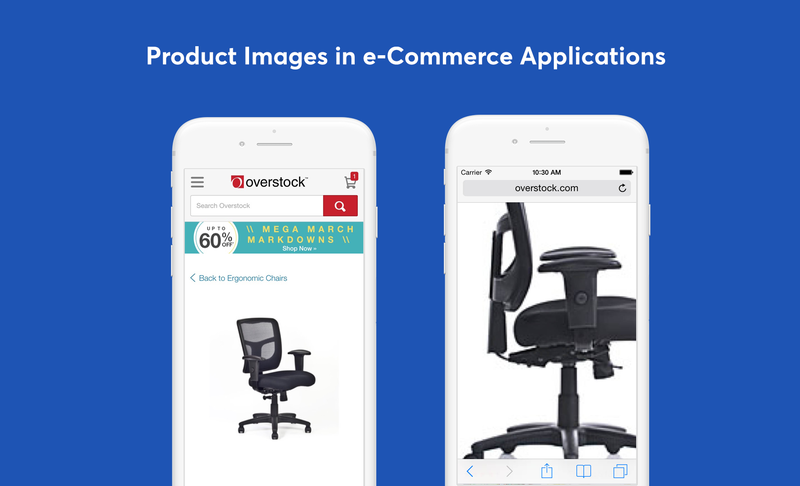 Zoomed up product images in Overstock's application. It’s quite surprising that, of the 50 top-grossing mobile eCommerce applications, over 40% didn’t support zooming gestures. Even sites that offered close-up versions of images experienced similar bounce rates, which suggests that support of product image zooming gestures in a mobile eCommerce app is fundamental. Considering the small screen size of mobile devices, this is a platform-specific issue. Supporting at least one of these features will put an app in the company of the top 50% of eCommerce applications, i.e., the top-grossing list. Low-resolution images are the equivalent of no-zoom images. Users are interested in seeing the details of a product clearly and need high-resolution images to do so. The option to zoom in on a low-quality image is pretty much useless, as it doesn’t allow the user to see details. The Baymard Institute discovered that 50% of apps do not indicate to users that they can pinch or double tap on product images. Indicating the availability of image zooming is important. Although these gestures are commonly known to mobile users, it still needs to be shown that they are available. The use of icons or visual representations is recommended in order to do this. As mentioned earlier, the small screen size of mobile devices is a primary roadblock when it comes to mobile eCommerce. The Baymard Institute observed that over 61% of mobile users will often use their desktops to complete their purchase rather than their phone. "Saveable" shopping carts in the Nordstrom and Overstock applications. A “save shopping cart” feature reduces the number of cart abandonments and enables shoppers to save items for a later purchase. Persistent shopping carts allow customers to continue their shopping without the need to search for the desired product on their return—a feature that 55% of shoppers would make use of. Make the cart work as a wishlist by saving items added to the cart. Create an option to allow shoppers to receive emails with saved items. Display reminders that they can use their desktop to finalize the purchase. Applying best practices for mobile forms is another consideration. 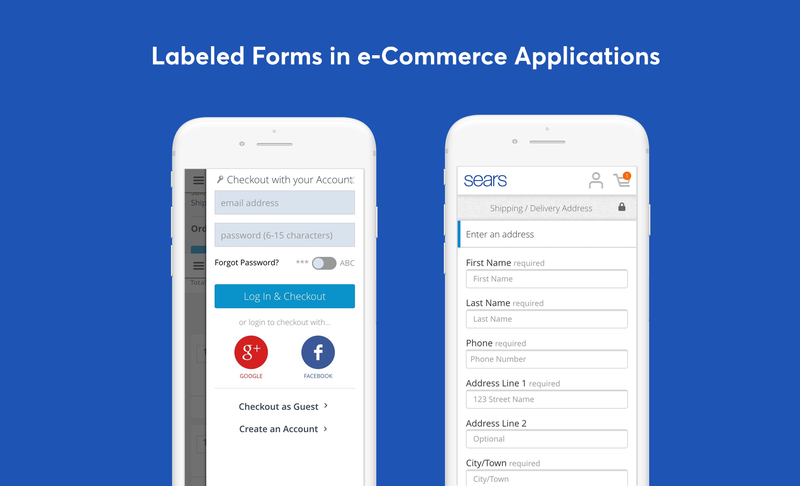 It’s important that the UX design of an eCommerce app or site, while eliminating any confusion, allow users to complete forms as quickly as possible. Place form labels above the form to improve readability, ease of use, and clarity. Explaining why certain information is needed will reduce user anxiety when filling out forms on their mobile. Match the text inputs with the appropriate keyboard. Display a dial-pad when inputting phone numbers and credit card digits, and a text-pad when inputting addresses and text. This will reduce user mistakes and accelerate form completion. Limit the number of input fields to reduce typing effort. Fewer input fields will generate a less loaded form and will improve the UX checkout flow. Automatically advance each field up the screen when completed. Doing this will not obstruct any view of the incomplete fields. Use steppers instead of drop-down menus to reduce shopper effort. Steppers are used to increase or decrease value by a constant amount and are a solution that’s faster to work with and more appealing to the eye. The main purpose behind auto-suggestion is to make it easier and faster for users to fill out forms. Auto-suggestion predicts common search queries and helps shoppers find products more easily. Mobile usability can be further improved by using credit card type auto-detection. Auto-detection streamlines the purchase process by providing immediate feedback for supported card types. Automation of as many data entry processes as possible—preferably with visuals—improves the user experience and will positively affect conversion rates. 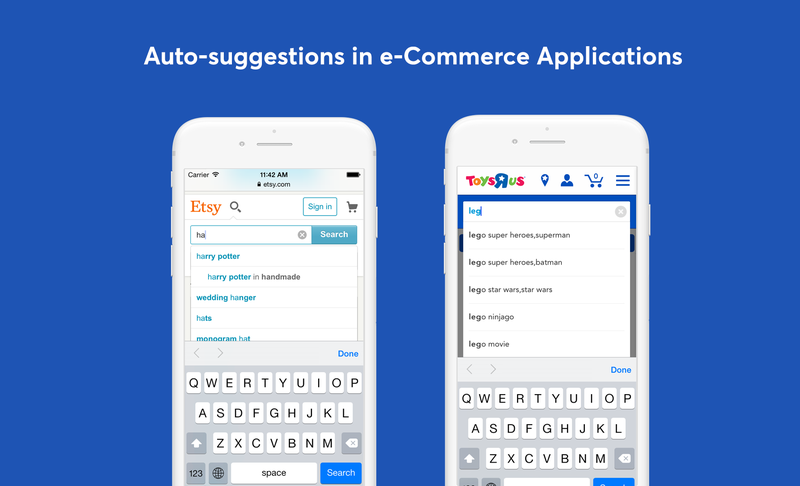 Search with auto-suggestion in Etsy's and Toys"R"Us' applications. 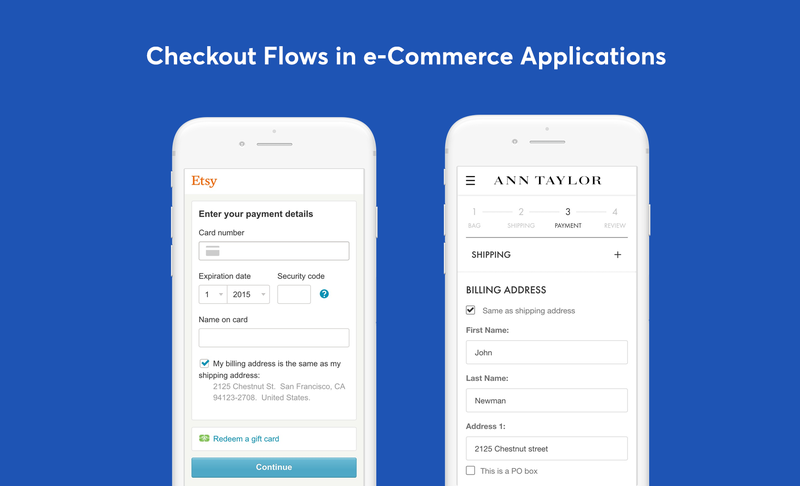 Address lookup and validation accelerate the checkout process—various APIs (such as Google Places and the USPS) enable easy implementation of this feature. Providing inline input validation for errors is also a best practice in mobile UX design. The lack of speedy performance is a major frustration for eCommerce shoppers. This can be helped by providing users live feedback on their progress (during checkout, for example), especially when they make an inadvertent mistake. This allows users to fix their mistakes immediately, which affects usability in a positive way. Microinteractions are details in a product’s interface meant to accomplish a single task while improving the natural product flow. Liking and rating a product, picking a color and size, and swiping down to refresh data are all examples of microinteractions. 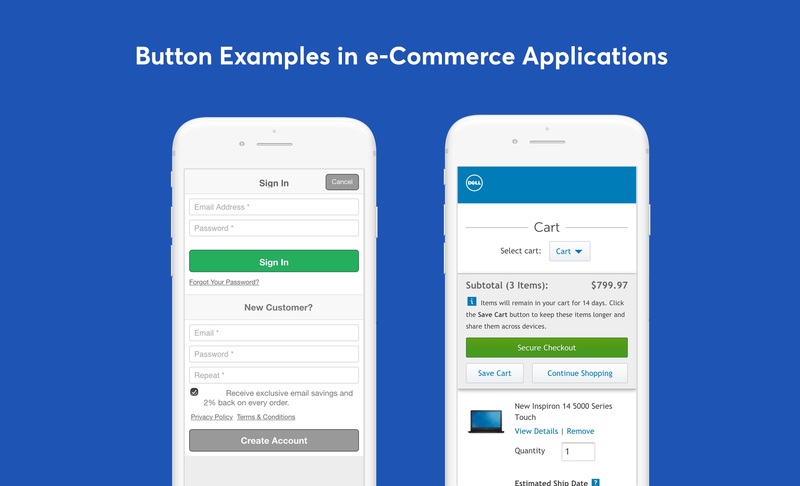 Considering how common they are, microinteractions can make or break the UX of a mobile eCommerce application. Improve user interaction with the app by responding to notifications. 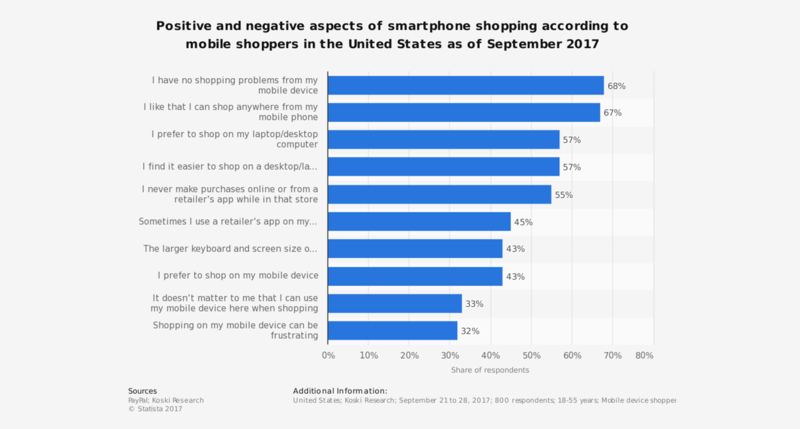 Understanding the most common ways shoppers hold their mobile devices improves mobile eCommerce user experience and usability. In 2013, Steven Hoober asked “How Do Users Really Hold Mobile Devices?” and observed how people interact with and hold their smartphones, and noticed three main behavioral patterns that should guide mobile UX design. Adapting interfaces to how people naturally use mobile phones will increase user comfort and reduce shopper anxiety. 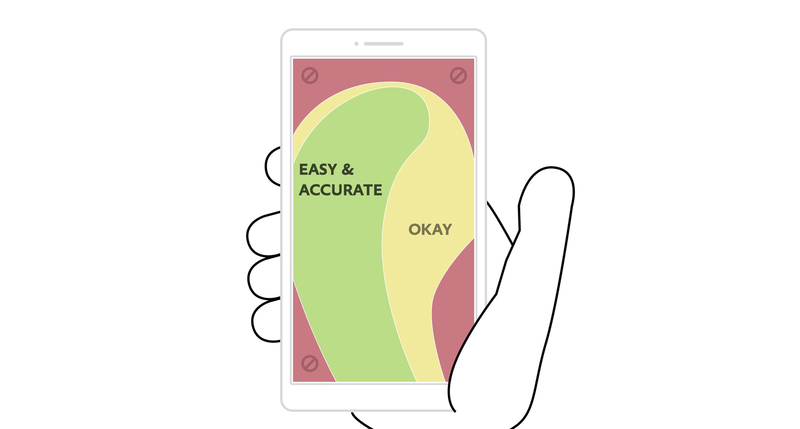 Mobile devices and screen sizes vary, yet the “thumb zone,” a critical aspect of the design and user experience, remains the same. 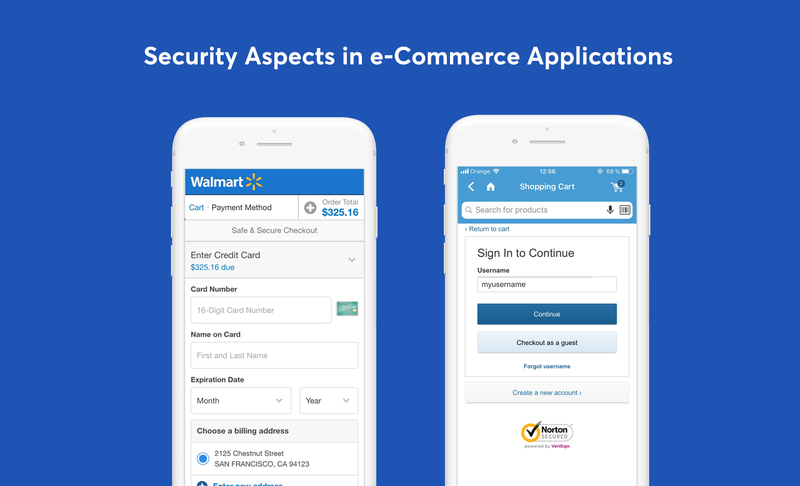 Security is one of the biggest concerns for users while shopping on mobile devices. Communicating that their transactions are secure adds a lot of value to the positive perception shoppers have towards a store. Make button labels suggestive and clear as to where shoppers are going. Words like “proceed,” “secure,” and “encrypted” will strengthen the psychological comfort of users. Use lock symbols to provide assurance to shoppers that their transactions are secure. Use trust badges by security providers like McAfee Secure and Norton. This helps users perceive a website positively (Baymard Institute study). Apply principles of color psychology in design for an even better perception of trust by shoppers. Some of these principles include audience-oriented and gender-specific colors. Shoppers use a mobile eCommerce site or app to explore products or to purchase a particular product; consequently, a well-designed search takes on critical importance for a mobile eCommerce application. eBay believes its site search is one of the most important features for mobile shoppers and emphasizes it by placing it in the center and above the fold on the interface. Make sure it is visible! Keeping the search bar easy to access and above the fold gives shoppers a way to search for products effortlessly. Provide look-ahead search by using data acquired from common search patterns, and display related products on search results pages. Provide advanced filtering options that allow customers to find their desired products quickly and effortlessly. An important aspect to consider when displaying search forms is that they are only valuable at the first stages of a user’s interaction with the application. 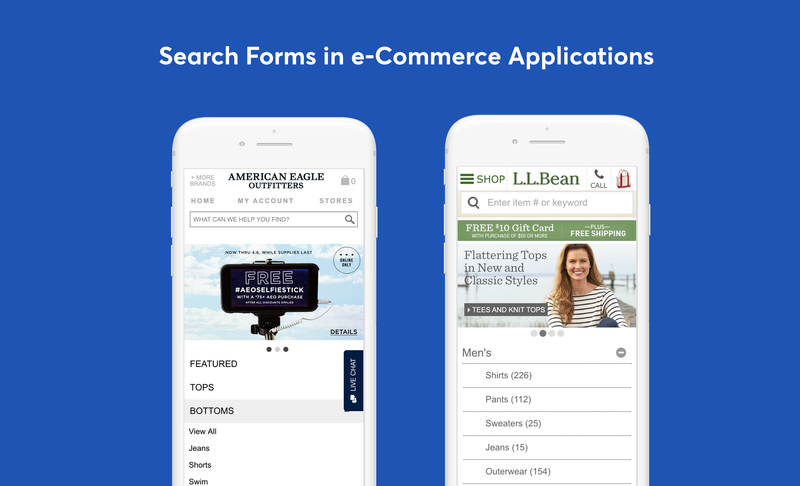 Users typically search the application at the beginning of their shopping journey, and there can be instances when displaying a search form later in the journey may harm the UX. For example, during the checkout process, search is no longer useful and will only distract because it could make users lose focus and forego their commitment to the purchase. Studies have shown that the checkout process is the most stressful part of completing a purchase online. The Baymard Institute reports a rate of 35% for cart abandonment because of the requirement to create an account before purchasing. In order to decrease cart abandonment rates, it’s important to design an easy, fast checkout process that doesn’t ask shoppers to register first. Usability studies have found that over 60% of users had difficulty in finding the guest checkout option; ergo, the guest checkout option must be clearly visible and easy to access. To promote user engagement, label each step of the checkout process by numbering and displaying the currently active step. Use visual representations like progress bars to display advancing forward in the checkout process. Provide an option to register and log in during the checkout process, but make it a choice. In order to reduce anxiety and bounce rates, suggest that users log in or register after checkout if they have checked out as a guest. Apply progressive disclosure techniques to improve user focus and load content 30% faster. In Summary: What Are Some Key Characteristics of Successful Mobile eCommerce Design? Mobile eCommerce trends show that the mobile eCommerce market is growing exponentially and the growth of the industry has created a multitude of benefits for sellers. However, with that came many best practices and standards for mobile eCommerce design that sellers must follow if they are to be successful. Shoppers expect a mobile application that works well, looks beautiful, and is adapted to their behaviors. 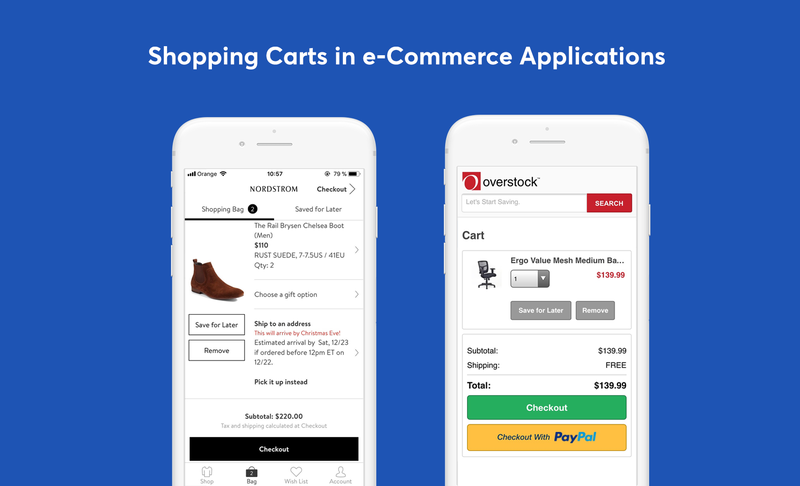 Although every application is different with its own limitations and goals, following the fundamental principles outlined in this article will help create successful mobile eCommerce applications.